Russian President Vladimir Putin has attended joint drills, demonstrating Moscow’s military might, with Belarus near Russia’s western border with Estonia. According to Press TV, Putin observed tank attacks, airborne assaults and air raids as part of the Zapad-2017 (West-2017) military drills on Monday at the Luzhsky range, located just over 100 kilometers east of Estonia’s border. Putin’s inspection of the drills comes amid deteriorating relations between Russia and the West as the two have repeatedly criticized each other for increased military activity around the Baltic region after a conflict erupted in Ukraine three years ago. NATO has questioned Russia’s real intentions behind holding the Zapad-2017 and has accused Moscow of hiding the exact number of troops involved in the drills. Members of the Western military alliance, including Estonia and Poland, say up to 100,000 troops could be deployed in the drills. As part of the drills, Russia showcased its missile power on Monday by test-firing a state-of-the-art cruise missile at a mock target in the Central Asian nation of Kazakhstan. The Russian Defense Ministry said the missile hit a mock target at a range in Kazakhstan after traveling some 480 kilometers following its launch from the Kapustin Yar firing range in southwestern Russia. The drills are also a sign of deepening military cooperation with Belarus, a country which has largely resisted pressures from the West to distance itself from Moscow. 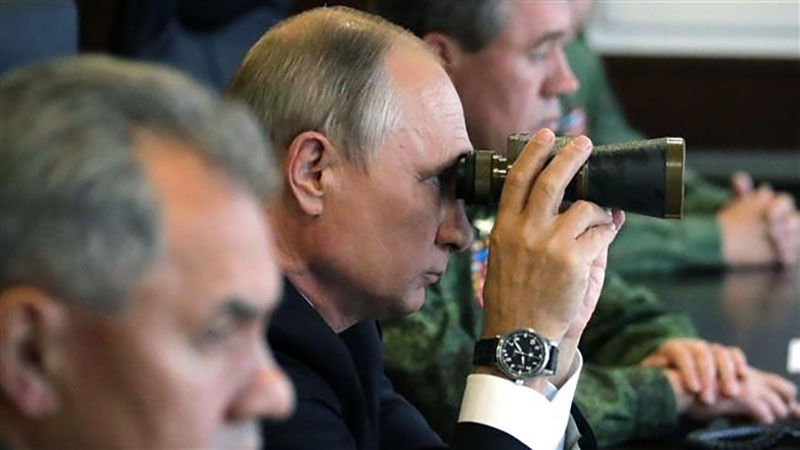 While Putin attended the drills, Belarusian President Alexander Lukashenko did not accompany the Russian leader in watching the drills, like a previous edition in 2013, saying he would watch them separately on Wednesday, the day which the week-long maneuvers end.